We now have one phone on Republic Wireless and another on Google Fi. I love a head-to-head comparison -- what better way to do that than to actually be a customer of both services at the same time? Who the heck is Republic Wireless? You'll be forgiven if you've never heard of Republic Wireless. It's a low-cost cell phone provider that hasn't appeared to put many dollars towards advertising following a 2013 national ad campaign that was relegated mostly to online ads and select cable TV channels including TNT, TBS and Comedy Central. The money not spent on advertising presumably goes towards offering low-cost cell service. I began following RW back in 2013. I was intrigued by the then-offer of $19-for-everything model. Yes -- that was $19 a month for unlimited minutes, texting and data. The downside? You only had two phone options to choose from, the network backbone was Sprint (notably smaller coverage area than AT&T or Verizon) and the company itself was still relatively new and untested. Republic Wireless has since experimented with a few different plans and routinely refreshes its lineup with new phone models. Still, though, at any one time you only have two or three phone models to choose from (Android only, no iOS) and the network backbone is still Sprint. How does Republic Wireless save me money? In a nutshell, RW leans heavily on pushing its customers to connect to WiFi whenever possible. When connected to WiFi, Republic's phones route calls over WiFi in order to reduce cellular minutes. RW then pays less to Sprint so you pay less to RW. If you leave the WiFi area RW switches over to the normal cellular network (even during the middle of a call...without dropping the call). The base rate is $10 a month for unlimited talk and text plus $15 per gigabyte of cellular data used. Any unused cellular data is refunded back to you as cash towards the next month's bill. Let me say that again: Unused data is not carried over month to month as "data credit" but instead is refunded to you as cash. Nice. Republic also provides an app that makes it easy to turn off cellular data access on an app-by-app basis. For example, you could allow GMail, LinkedIn and Chrome to work any time but restrict Facebook (and all those auto-loaded inline videos) to pull data only when connected to WiFi. If you are a heavy cellular data user then Republic is probably not for you. If, however, you are most often connected to WiFi when using apps then you could potentially save a ton. More on that, below. WHAT the heck is Google Fi? Of course you know Google, but what is "Fi"? Basically that's a nod to "WiFi" as Google's low-cost cell phone service is based on the same money-saving principle as Republic Wireless: get phone users off of cellular and on to WiFi. I could almost leave it at that except that Google adds one more twist: Google's phones use TWO cellular backbones: Spint and T-Mobile. When not on WiFi Google's phones automatically connect to whichever cellular service is stronger at the moment. This translates to better cellular service thanks to the wider coverage area. That's a nifty idea and probably involved some serious negotiation efforts between the two carriers. Like Republic, you only have a small number of phone model options if you want to take advantage of the dual-carrier coverage. I say "if" because you also have the (unsupported by Google) option of ordering a Google Fi SIM card and sticking it in a non-Google phone. At this point I won't go more into that option other than to say, "Buyer beware". 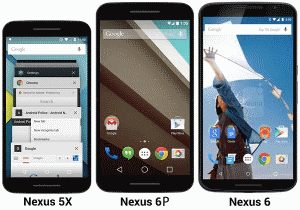 For the moment Google is only officially supporting the use of three phones: the Nexus 6, Nexus 6P and Nexus 5X (the model I have). Google also supports some SIM-enabled tablets (including iPads) at a cost of $10 per GB of data used -- read more about that here. The base rate for Google Fi is $20 a month for unlimited talk and text plus $10 per gigabyte of cellular data used. Unused data is credited as cash towards your next month's bill (just like the Republic Wireless plan). Note that this is much better than simply carrying over unused data month-to-month as most "carryover" plans expire unused data/minutes after a certain number of months. So, those base rates for unlimited talk and text are appealing but will you actually save anything by paying for every megabyte you use versus a more traditional fixed-rate plan? Fortunately this part is easy if you know your typical monthly data use. On AT&T my plan was an older option of 3GB for $70. Under Republic the same plan would cost $10 + (3 x $15) = $55. Not bad but not earth-shattering, either. On Google Fi the same plan would be $20 + (3 x $10) = $50. Better but still nothing to really shout about. Both plans would save me money but other carriers have comparable plans if you *know* you need to consume upwards of 3 GB of cellular data each month. If I consumed 5GB or 10GB a month the Google Fi and RW plans would end up being more costly than standard plans from other carriers. Remember, though, that the idea is not simply to switch service providers but also to attempt to leverage WiFi as much as possible. How much could I save by consciously shifting more of my data use towards WiFi and away from cellular? How much would I need to change my behavior to do so? This is what I put to the test. I used my average data consumption under AT&T as a baseline. 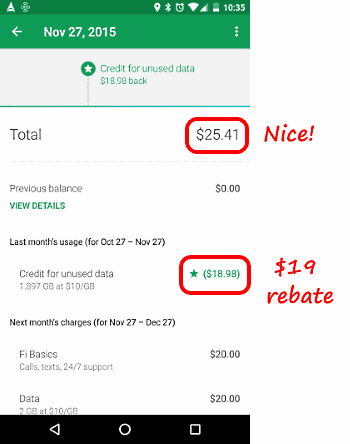 For my first month under Google Fi I was a data-saving hawk. I manually disabled all cellular data anytime I wasn't actively using an app. During the first month I *did* use the phone for some Google Maps navigation so I didn't skip cellular data use entirely. My first month's Goolge Fi bill totaled $25.41. My first Google Fi cellular service bill. The second month I allowed cellular data to stay connected all the time and simply avoided extraneous use of apps when not connected to WiFi. I also used Android's default app settings menu to restrict background data for certain apps (like Facebook). My second month's bill totaled $30.47. My wife switched from a feature phone (gasp!) to a smart phone. Oh, she had smart phones before but never embraced them due to size and cost. Professional needs finally required that she make the transition to a smart phone. Based on her history of *not* needing cellular data and being unlikely to become a large data consumer we went with Republic Wireless for her phone. We selected the Motorola G (3rd gen) over the basic Motorola E (3rd gen) or the upscale Moto X (2nd gen). The G boasts an excellent balance of features, horsepower and battery life. Our initial month went exceedingly well in terms of cost: the first Republic Wireless bill was nearly 50% less than our first Google Fi bill. My first Republic Wireless cellular service bill. Using the Republic Wireless app (already installed on my wife's phone) I turned off cellular data for a number of apps but left cellular data enabled. She wasn't going to be too keen on manually enabling/disabling data so I didn't try for a "minimum data month" baseline on her phone as I had done on mine. We skipped directly to what would be her normal use. The first month's bill on Republic Wireless totaled $13.18. Can you wrap your head around that? A whole month of unlimited talk, unlimited texting and (very conservative) cellular data use for $13.18. That includes $2.36 worth of taxes. Of course my wife was connected to WiFi most of the time she ran any apps. She used a paltry 0.1 GB of cellular data but a healthy 2.2 GB of WiFi data. I'd say that's proof-positive the "push cellular customers to WiFi" model is a win for both cellular providers and consumers. I mentioned my legacy AT&T plan was $70. That was actually just the base plan price for my phone. Add to that my wife's phone, a limited 200 texts-per-month option for my phone, a limited 1000-texts-per-month option for my wife's phone plus taxes and regulatory fees, our monthly bill was actually $135 for one smart phone and one feature phone. It was a noncompetitive plan (to put it mildly) which is why I was so keen on switching providers pending the refresh of Republic's phone models and the launch of the new Nexus phones. A conservative approach would pin my wife's average bill at $20 a month (her first bill was under $14) and my average bill around $35 a month (my first two bills averaged less than $30 a month). At that rate, a combined monthly bill of $55 translates to $80 per month of savings. Switching carriers has already saved me 70% in a single month. Long-term conservative estimates put my expected savings at 60% or better. There are, of course, other factors to consider beyond the monthly bill. I'll delve into some of those items in the coming weeks and months. For the moment, though, I am one happy camper and would not hesitate to encourage Android-friendly consumers to consider either Republic Wireless or Google Fi. There are no contracts and you can transfer your existing cell phone number so the only notable risks are the cost of the phone (you must buy the phone up front) and the chance your area is not well covered by Sprint (Spint + T-Mobile for Google Fi). Have you tried Republic Wireless or Google Fi? (or, like me, both of them?) Please comment with your experiences, below! Thanks for posting. I'm currently with RW and appreciate the savings, but the call quality can be an issue occasionally. However, I've noticed that improvements in that area continue to be made (I've been with RW for a couple of years now). 1. Why Fi if you are saving so much more with RW? 2. How does FreedomPop fit into your comparison? 3. Have you made any changes since January? I have used both Republic Wireless as well as Project Fi because I don't believe in paying too much for cell phone service. I would like to start off by saying that they are both good options but I have to go with Project Fi over all and here is why. With republic wireless you only get 3G for that price 4G is significantly more. With Project Fi you get 4G and it only costs me $5 more a month. The second reason is that with Republic wireless you only get Sprint and with Project Fi you get Sprint and T-mobile, so as a result I get a lot better coverage. The third reason is that Project Fi has better phones and the newest Android updates. Because it is a Google company it will always have the newest versions of Android before anyone else. The fourth and final reason why I chose Project Fi over Republic Wireless is call quality. The transition between WiFi and cell is much smoother on Project Fi. Great rundown, Chris -- thanks for adding your experience and personal take from the perspective of having used both services. It's worth pointing out that Republic Wireless is on the verge of offering a number of higher-end phone options including both current Google Nexus models, the Moto X Pure and a few Samsung Galaxy 6 and 7 models (exciting news for RW customers!) These new phones are slated for availability by July, 2016. In the first few months of having both services I can echo Chris Lazzara's point on cell coverage and call quality. So far I have noticed somewhat improved coverage for Fi versus RW in and around Austin and San Antonio -- totally what you'd expect given that both phones support Sprint but Fi adds T-Mobile's coverage. I've also spent a week with both phones/services in the greater Memphis, TN, area but both performed equally well there. Google Fi's coverage advantage is more likely to be noticed when operating outside of larger metro areas and away from the generally well-covered interstate highways. Call quality / dependability has also been a little more reliable on Fi. However, on this point I have to highlight the fact that I'm comparing a Nexus 5X phone (Google Fi) to a Motorola G3 phone (Republic Wireless). The 5X is a more capable piece of hardware with more computing power and more RAM which *may* come into play when routing voice over WiFi. The occasional call quality issues (static or sound gaps) appear to happen more frequently over WiFi connections than cellular and more frequently on the Motorola G3 (RW) phone rather than the Nexas 5X (Google Fi) phone. I'm a heavier cell data user than my wife so Google Fi is less expensive once you get past the first couple of GB of data. So far, though, my wife continues to use less cellular data so she "wins" with a much lower monthly bill on RW -- about half of the $30/month I'm paying for Fi. No changes, yet -- I must say I'm quite pleased overall with both Fi and RW and have had no regrets about moving on from AT&T. 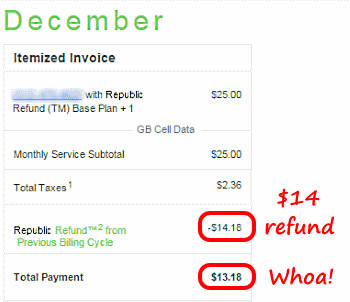 I'm happy when I get my $30 Google Fi bill and downright giddy when I get my wife's $15 Republic Wireless bill. That probably best sums up my experience with both services: Happy to get a bill. I was checking out RW today. RW now has the dual (Sprint/T-Mobile) networks. So what's the verdict now between Republic 3.0 (with new phones & dual networks) and Google Fi ?? Yes, I'm overdue for a big update on Republic Wireless. The standout feature (to me) was the pay-only-for-what-you-use model which is now gone for new customers (but existing customers are unaffected). On the plus side, you now have an excellent selection of higher-end phones to choose from versus the limited selection of two or three models under the old plans. I'll post a RW update soon and will comment here to give notice of the new post. 1) the new Republic Wireless phones only work on the T-Mobile network. 2)The new phones won't work on the Sprint network. 3)The Sprint Network won't get new phones until December at the earliest. 4)When you have a new Republic Wireless phone (after December 2016) you will need to specify one network over the other. You will have to pick either T-Mobile or Sprint. The phones (if they are even the same models) will NOT jump between networks like Project Fi phones do. The other consideration between Fi and RW, RW does not at present offer International calling service. You can phone home from Europe or the UK but only on WiFi vs Fi which can access UK/Europe GSM networks. A decision-maker for me. I have been on Fi for six months. I'm having more frequent, very frustrating problems with voice calls at my home. The basic reason is due to poor coverage by any cellular network at my house (except Verizon, but I have severed the link to that empire...). My Nexus 5x will try a call on cellular, and though a few bars show (not sure whether Sprint, T-mobile, or both), no sound, and the call does not go through. Only then on a re-dial will Fi put the call through my WiFi. Alas, WiFi calls also drop / interrupt. The other party cannot hear me, or vice versa, or call drops. Now more frequent. I'm thinking of taking my phone back to RW (I used to have a MotoG on that network), to see if performance is any better. Yet, if RW is the same cellular network, I'm not sure it will be any better. Just hoping its technology for VOIP via WiFi works better with my Comcast Internet service... Or, perhaps the whole problem is with Comcast and intermittancy of their Internet service. Hard to know. Frustrating / just a lot of hassle with call quality where I live... Any advice is appreciated. Funny you were experiencing those problems with Fi,@gregfelker. I had those same issues on RW. Now that I'm on Fi, everything works perfectly. I guess there isn't one right answer for everyone.